M1 Traffic is part of the UK Traffic News network. 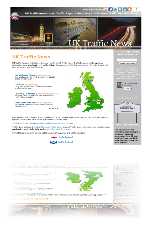 UK Traffic News is our central independent traffic news website which features the latest traffic news from around the UK. M1 Traffic is however dedicated to M1 traffic news, M1 traffic reports and information about M1 delays and roadworks. M1 Traffic is one of our regional or motorway specific websites. If you are interested particulary in M1 traffic or looking for a website that specialises in M1 traffic or a website dedicated to M1 traffic then that is exactly what M1 Traffic.co.uk is all about. You can find all the latest M1 Traffic Reports quickly and easily. Some of the latest M1 traffic news is below but to find all the latest M1 traffic news visit our latest M1 traffic news and updates section. M1 Traffic also features news, updates and other information about the M1 motorway.